The start of a new year is always a good time for evaluating your finances and seeing if you want to make any changes or improvements for the coming year. Budgeting can be overwhelming if you've never done it before, and it can be hard to know where to start. Jordan and I are by no means experts at budgeting and saving, but I like to think that we do a pretty good job managing our money as best we can. Recently someone on Facebook posted a general question asking what people recommend as their #1 budgeting/financial tip. It inspired this post, where I wanted to quickly share 3 things I would recommend doing for your finances in 2017. Whether or not you want to commit to tracking purchases and keeping up with a budget, these are simple things you can do to quick-start your budgeting for the new year. 1. Start keeping a monthly "blow money" allotment and stick to it. I did a full post here about what blow money, so read that for more details. The basic idea is to limit your spending on personal "extras" such as clothing, jewelry, video games, and just anything you buy for yourself that is a want not a need, by setting a specific dollar amount for the month. This could be any amount from $20 all the way to $200 or more depending on your income, but the idea is to choose an amount that's higher than penny pinching but lower than "let's go buy all the things." Having a blow money amount for the month will cause you to not make random purchases but really think about what you're buying. This is a great way to start budgeting in a small way and being more intentional about personal "want" purchases. Again, for more about what blow money is, how to choose an amount, and how to decide if something falls into the blow money category, read this post. 2. Set up a Christmas savings account for the year and automatically add to it every month. Do you ever find yourself getting to the end of the year and feeling stressed about paying for Christmas presents? If so, you could save yourself a lot of that stress by establishing a Christmas account at the beginning of the year. This same concept can apply to any occasion or event you know is coming up where you will need to spend a good amount of money. Choose an amount that will work for your budget, and add that amount every single month to the account. The best part is, the amount doesn't have to be a lot! We add $25 every month to our Christmas account, and 12 months later we have $300 to spend on presents that has already been paid for. Now, I will tell you that we do spend more than $300 on presents (large family problems), but the majority of the cost is paid for by the money we put in all year. This is a great way to start getting in the habit of saving without having to use a large chunk of your income. **This is also how we budget for travel: with a separate travel account that we put money into every month. You can read more about that in this post. 3. Going along with Tip #2, set up a separate savings account that is not your bank. Capital One 360 is a savings account that will give you a slightly higher interest rate than you would get at a bank (not very high at all, but still, interest is interest). You can set up a number of accounts within your account, so for example we have a savings account for: Christmas, travel, Europe (separate from travel specifically for our trip to Europe! not soon, just at some point hopefully), my freelance editing, and our emergency fund. We automatically set up a transfer at the beginning of every month for money to go into Christmas and travel. At the end of the month, any extra money is transferred to our emergency fund. We aren't putting any money at all into Europe right now, but it's still sitting there getting us a few dollars a month in interest. We get interest paid to us every month, and the money is completely separate from our bank account but can be transferred back and forth if we need to make a withdrawal. Having an account like this is a great way to dip your toes into savings accounts without doing anything intimidating like investing in stocks or whatever. Again, you can get more information and sign up for an account here. 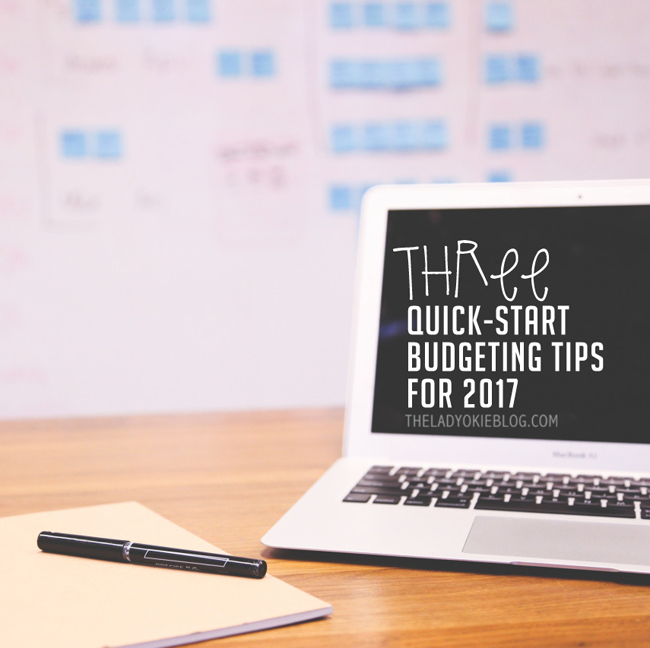 So those are just a few tips to quick-start your budgeting for 2017! These aren't new ideas at all, but they are things we have found to work well for us so far and I wanted to share. You can check out all of my budgeting posts here, including why we recommend using credit cards (we love our Discover Card), how we budget for food, and a look at my budgeting binder. Do you have any budgeting tips to add? What is your #1 tip to share for budgeting in 2017? These are all really good tips, especially the one about starting to save for Christmas in January! That would make Christmas so much easier to manage. My favorite thing to do is take out an extra $5 every time we go to the grocery store/Target and save it up. It adds up pretty quick & then we use it whenever we take a trip somewhere. I think the biggest help for us is the Every Dollar Budget App by Dave Ramsey. It's so convenient and easy to use and helps us stay on track. I agree with you that blow money is super important. In the long run it can help save a budget because you aren't as temped to be frustrated because you have a little fun fund to spend. These are such great tips. I love your budget posts. My mom has always had a separate savings account so that when Christmas comes around she can really enjoy it. She loves Christmas more than anyone I know and it makes her so happy to not have to worry about money at Christmas. We try to save for gifts throughout the year but that budget does get cut a lot when other things come up. I really like the idea of having a separate account for something like Christmas that they money automatically goes into. I tend to think that we have to be saving a lot of money or it's not worth it, but you're right, $25 a month really does add up after a year. Also, a good tip is to shop around for your fixed expenses. Last year we changed cell phone plans and our internet package to better match what we actually use. That is a good idea too! I should really check around and see if I can get a cheaper cell phone plan. I love the idea of the separate savings accounts. We do that for travel and such, but not in a separate account! Yes, we had Capital One when it was ING as well! That was like forever ago now! haha. Long time reader but I never comment! I really like your budgeting posts. I think budgeting is one thing that has prevented so much conflict in our marriage so far. We use the blow money concept and it's nice having that money allotted for each of us so we don't have to be like "Um, you spent $50 on what?" I like the multiple savings accounts idea too. I haven't thought of using a service outside our bank, but it sounds like something worth looking into. I love this!!! We have been budgeting for 5 years now and it is a total game changer! "Blow money" is the best! It really really is! Prevents a lot of problems between us on what we choose to spend money on. Great tips! I finally downloaded Mint today and Kevin and I are already intrigued by what it shows for January. It has included a dinner date out at a very expensive restaurant (cha-ching) where we got a thank you gift card for Kevin's parents since they watch Ava for free so often (double cha-ching), and a renovation of our guest bathroom (quadruple cha-ching). So January hasn't been the norm but seeing it all right there on the screen was eye opening! I 110% agree with the allocated savings accounts! We have one for Christmas, Layoff (when Michael isn't working and we don't have income), Kids, Home/Auto Insurance, and Property Taxes. So each week there is a transfer that goes into those accounts. We really need to set up a vacation one! Thanks for sharing about the Capital One 360! Very neat! I've got to figure out how we can allocate "blow" money for ourselves... that's probably where our biggest problem is! Thank you so much for sharing about your budgeting! I really have found all of your words on "blow money" so helpful. Since I'm a stay at home mom who doesn't have a salaried job, I've always had this feeling that I can't spend money on myself since I don't earn money. My husband makes it clear to me that I can spend money, but I still have the weird feeling that I shouldn't. Silly, I know. But my husband and I recently decided to budget in "blow money" for us, and it's been so freeing to me, to know that there is money specifically allocated for me to spend if I want to have a coffee date with a friend or something. Hello! I love all of your budget tips! I have a question about Capitol One 360... since it seems just a savings account, how do you transfer funds back out? Just transfer to your original checking? Yes! You can easily transfer money back and forth from your Capital One 360 to your regular checking account at your bank. The only hitch it that it takes about 4 days to process so you would need to think a few days ahead of time if you really needed to transfer money. For example, when we bought our house, we moved the down payment money from our 360 back into our regular checking account about a week before we would need it. There is also a limit on how many transfers you can make per month, but it's a high number and we've never gotten close. It's just so you don't transfer back and forth every three days or something crazy like that. Hope that helps!